PaytmKaro for prepaid online mobile recharge, DTH recharge & data card recharge, or pay your mobile or utility bills and also shop online. It’s easy, it’s quick and you can trust Paytm, just like 100 million customers do! Paytm – Great Diwali Sale is started. In addition Paytm is back with a New Money offer. Add Rs.5000 in your Paytm Wallet and Get flat Rs.250 Cashback in your Paytm Wallet. Hurry up and grab the awesome offer on 3rd November. 2. Now Proceed to Paytm wallet option and click on Add money. 3. Then Add amount Rs.5000. 5. Once Coupon applied pay the required amount. 6. Hiva ! You will get your cashback within 24 Hours. > Applicable for only Add money in Paytm Wallet. 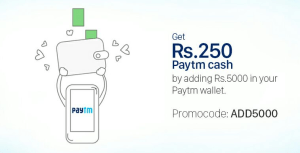 > Cashback of 5%, maximum Rs.250 on adding minimum Rs.5,000 cash in Paytm wallet. > Promo code can be used only once per user. > This code will be valid for minimum transaction of Rs.5,000. > This code has to be used in a single transaction. > Code validity dates – starting 3rd November,2015 00:00 hrs to 3rd November, 2015 23:59 hrs. > Applicable on Paytm Web/Mobile App/wallet app. User can to use credit card & debit card to add money.